@MaineSkiFamily became @VermontSkiFamily for a weekend. 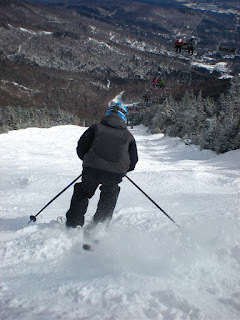 We had not visited a new mountain in a long time so we decided to make a long weekend trip to Vermont to hit up Sugarbush and Mad River Glen. For those of you that read this blog, you know we are big Saddleback skiers and we wanted to hit some mountains in Vermont that had a reputation for being a 'Skiers Mountain'. Seemed like these two mountains would fit the bill. We picked up the boyz after school and headed to Vermont. First our car thermometer hit 70 degrees. Bogus. Then when we crossed the border into Vermont and it dropped all the way down into the 60's and pouring rain. Double-bogus. We shrugged and decided we would make the best of it. It would be nice to spend time together as a family as we had reservations for the Snow Creek slope side condo's. Travel Note: Sugarbush website lists two ways to get to Sugarbush from the south. You can get off Exit 3 off I-89, take 107 to 100 north. This route is pretty up and down and round and round as it follows the river up from the valley. It is still in pretty rough shape from Hurricane Irene flooding as well. It is better to keep on 89 to Exit 9 and come at Sugarbush from the North going down 100 south. Weather report indicated a possibility of some snow on the backside of the rain. We had a nice 2"-4" snow overnight to cover up the soggy now frozen snow. 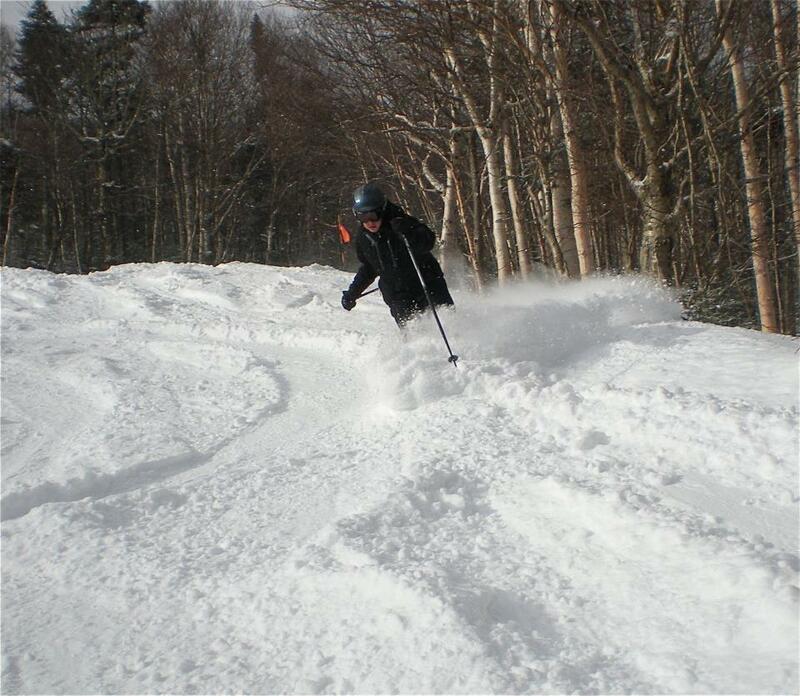 Sugarbush didn't groom much overnight so it some powder over some hard frozen snow. However it really didn't ski too bad. You just had to stay on your toes for the varying conditions. We spent the morning exploring 3 of the 4 peaks of the mountain. We stayed away from the expert Castlerock area as we heard it was pretty bony. 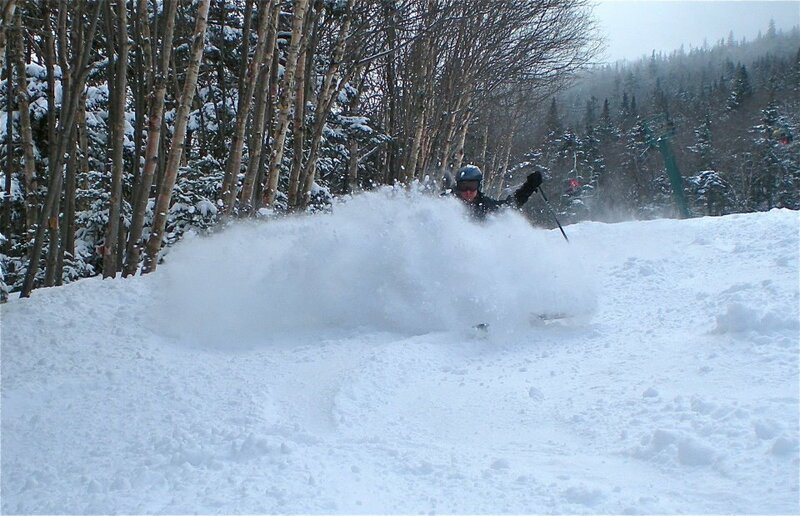 The North Lincoln and Gadd peaks skied well. 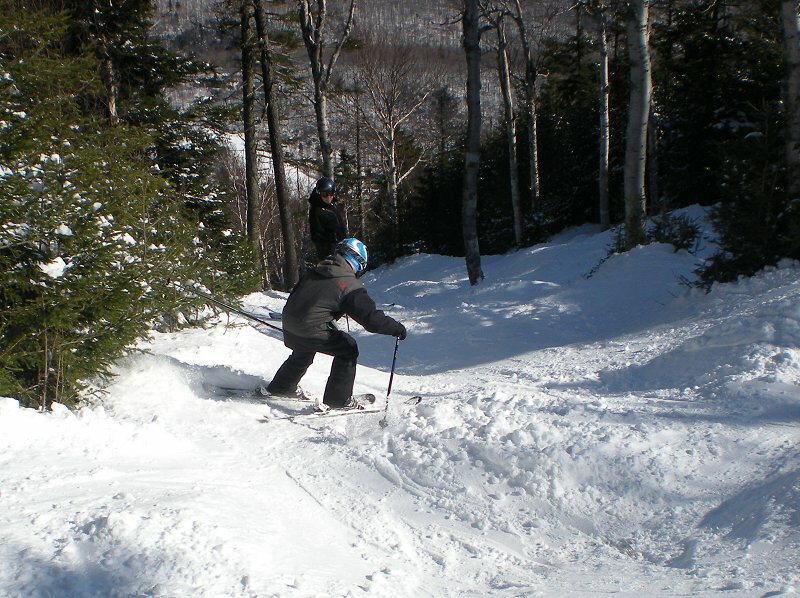 We hopped into a couple of glades with Racers Edge and Eden being fun. The more southerly facing Lynx peak held manky snow in the afternoon. Overall a very pleasant day and we felt very blessed to have some decent conditions. Weather report said a couple of inches overnight was possible. There was some buzz in the lift lines on Friday for a bit more. We rolled out of bed and checked the snow report. They were saying 4 at the bottom and 10-11 inches up high. Alec went out and measured on the car. A good 5 inches. GAME TIME. We gobbled down some pancakes, geared up and joined the powder hounds for the 8AM opening of the SUPER BRAVO EXPRESS lift. We knew this was not like Saddleback where we could kind of take our time with getting the snow. The super-quad would be dumping tons of people on the trails and the time to get it was NOW. We made a dash for Moonshine which was a fun bump / glade trail we found on Friday. First tracks of 6"-8" fluff. 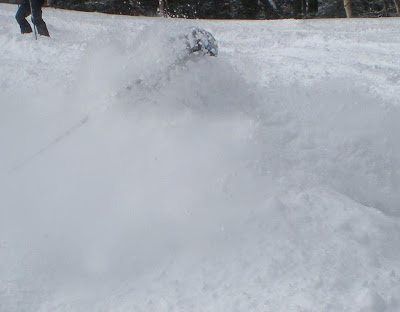 It was not perfect as we still hit hard snow underneath but it was wonderfully good. We made another lap on the Eden glade which was a ton of fun as well. Someone get this kid a snorkel! The best was yet to come. We picked up Mom and set off for the upper Heaven's gate lift which opened at 9AM. Skiing to the lift Alec and I took Lew's line glade. Pretty steep and Alec found some un-tracked. Very nice. Alec ended up losing his ski in the glade for a bit so Juley and Isaac got on the lift ahead of us. About 2/3rds of the way up the lift we see Juley and Isaac bombing down Rip Cord under the chair saying "See you at the bottom". There is no waiting for friends or family on a powder day of course. Isaac reported it was one of his best powder runs ever and he elicited 3 hoots from the chairs for his skiing heroics. Alec and I decided to take in the Glades around the Paradise trail. Deep and fluffy. 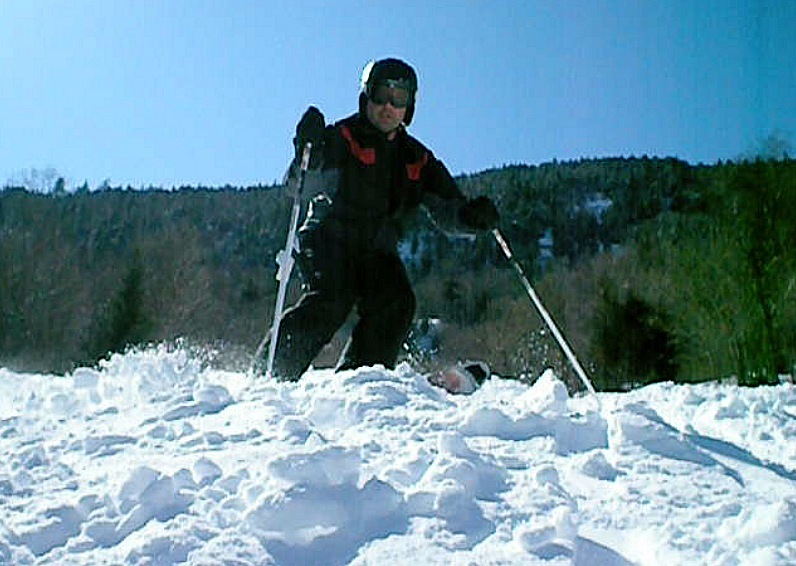 Really good skiing in a foot of snow. We lapped Heaven's gate a couple of times and Ripcord still delivered deep turns and got one more run off Super Bravo before lunch and were rewarded with some nice fluff on Spring Fling. After lunch we headed over to the Mt. Ellen side by taking a two mile inter-mountain chairlift. A little odd going down on a chairlift. Mt. Ellen is really fun and has some serious vertical. FIS at the top is steep and held great snow. All the cruisers were a blast and Isaac got to bonk around in the terrain park a bit. It was really a fabulous day and we capped it off with a very nice dinner at Easy Street Cafe in Waitsfield and a fire back and the condo. We packed up and headed over to Mad River Glen. This is a really fun, throwback place. It was a beautiful spring day with temps getting into the 50's by afternoon. The single chair is great to ride in and gets you access to some unbelievable tree and expert skiing. We tried Lynx and Beaver but the combination of them being skied out a bit exposing the frozen stuff underneath plus our legs just being beat from two days of skiing powder made us stick mostly to the groomers. Upper Antelope is a great cruiser from the top of the single chair. We spent the rest of the day bouncing around the more southerly facing slopes basking in the sun shine. MRG offers a lot of great green and blue cruiser terrain. There marketing slogan is 'ski it if you can' but there is something for everyone here but no snow boarders allowed... although they did have a couple of terrain features made out of natural logs with a plastic upper to slide on that Isaac had fun on. The warm spring sun brought out the masses so it got very busy with long lines so we made one last run bouncing down some springtime corn bumps of Upper Grand Canyon and Lower Grand Canyon. Great fun and a great way to end the trip. 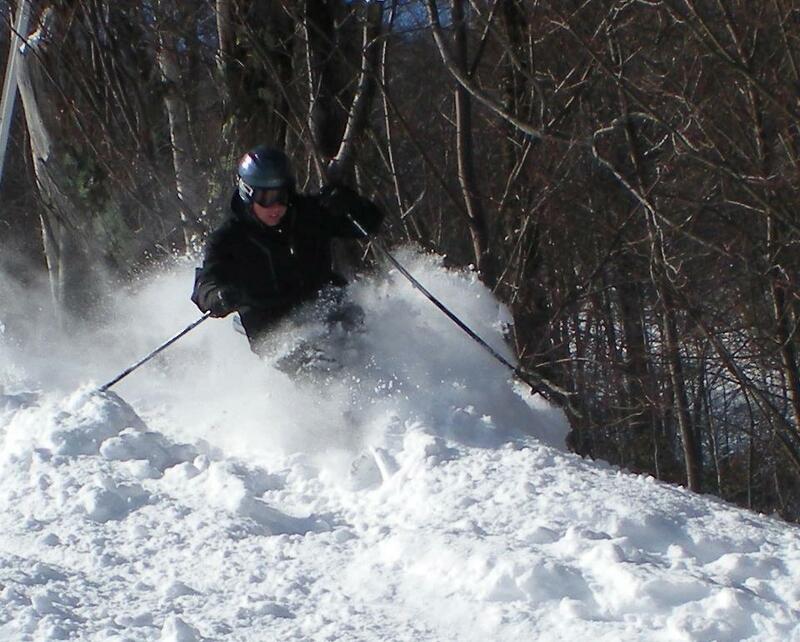 We had a really good time and really liked Sugarbush and Mad River Glen. They offer some tremendous skiing, the vibe is good and the people are friendly. 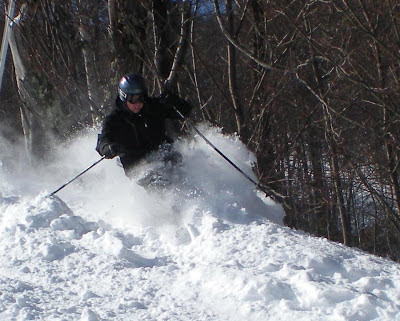 I felt like skiing came first at these resorts which is what we like. At the end though, we are still big Saddleback fans. There is something different and unique about Saddleback trees that we spend a lot of time talking about... another blog post to come on this topic. Regardless, we highly recommend both places! If you like this blog please like our Facebook page or follow us on Twitter to receive update notifications.